These highlights do not include all the information needed to use DUPIXENT safely and effectively. See full prescribing information for DUPIXENT. To report SUSPECTED ADVERSE REACTIONS, contact Regeneron at 1-844-387-4936 or FDA at 1-800-FDA-1088 or www.fda.gov/medwatch. DUPIXENT is indicated as an add-on maintenance treatment in patients with moderate-to-severe asthma aged 12 years and older with an eosinophilic phenotype or with oral corticosteroid dependent asthma. DUPIXENT is not indicated for the relief of acute bronchospasm or status asthmaticus. 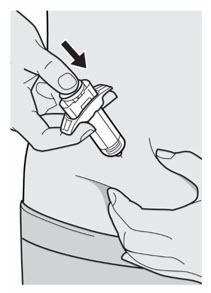 DUPIXENT is administered by subcutaneous injection. The recommended dose of DUPIXENT for adult patients is an initial dose of 600 mg (two 300 mg injections), followed by 300 mg given every other week. The recommended dose of DUPIXENT for patients 12 to 17 years of age is specified in Table 1. DUPIXENT can be used with or without topical corticosteroids. Topical calcineurin inhibitors may be used, but should be reserved for problem areas only, such as the face, neck, intertriginous and genital areas. DUPIXENT is intended for use under the guidance of a healthcare provider. 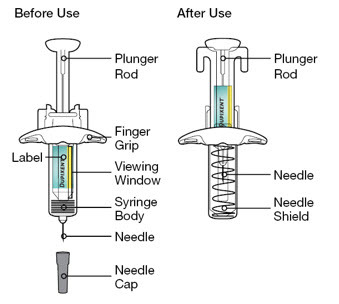 A patient may self-inject DUPIXENT after training in subcutaneous injection technique using the pre-filled syringe. Provide proper training to patients and/or caregivers on the preparation and administration of DUPIXENT prior to use according to the "Instructions for Use". For the initial 600 mg dose, administer each of the two DUPIXENT 300 mg injections at different injection sites. For the initial 400 mg dose, administer each of the two DUPIXENT 200 mg injections at different injection sites. 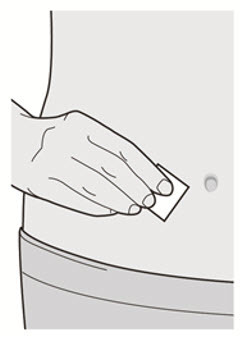 Administer subcutaneous injection into the thigh or abdomen, except for the 2 inches (5 cm) around the navel. 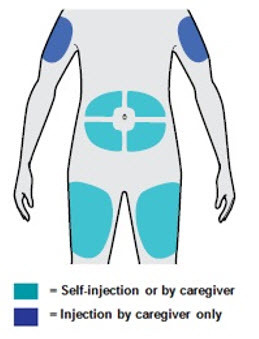 The upper arm can also be used if a caregiver administers the injection. 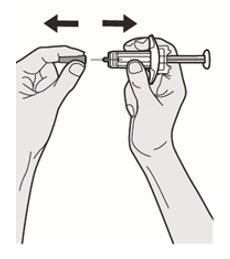 Rotate the injection site with each injection. DO NOT inject DUPIXENT into skin that is tender, damaged, bruised, or scarred. The DUPIXENT "Instructions for Use" contains more detailed instructions on the preparation and administration of DUPIXENT [see Instructions for Use]. Before injection, remove DUPIXENT pre-filled syringe from the refrigerator and allow DUPIXENT to reach room temperature (45 minutes for the 300 mg/2 mL pre-filled syringe and 30 minutes for the 200 mg/1.14 mL pre-filled syringe) without removing the needle cap. Inspect DUPIXENT visually for particulate matter and discoloration prior to administration. DUPIXENT is a clear to slightly opalescent, colorless to pale yellow solution. Do not use if the liquid contains visible particulate matter, is discolored or cloudy (other than clear to slightly opalescent, colorless to pale yellow). DUPIXENT does not contain preservatives; therefore, discard any unused product remaining in the pre-filled syringe. DUPIXENT is contraindicated in patients who have known hypersensitivity to dupilumab or any of its excipients [see Warnings and Precautions (5.1)]. Hypersensitivity reactions, including generalized urticaria, rash, erythema nodosum and serum sickness or serum sickness-like reactions, were reported in less than 1% of subjects who received DUPIXENT in clinical trials. Two subjects in the atopic dermatitis development program experienced serum sickness or serum sickness-like reactions that were associated with high titers of antibodies to dupilumab. One subject in the asthma development program experienced anaphylaxis [see Adverse Reactions (6.2)]. If a clinically significant hypersensitivity reaction occurs, institute appropriate therapy and discontinue DUPIXENT [see Adverse Reactions (6.1, 6.2)]. Conjunctivitis and keratitis occurred more frequently in atopic dermatitis subjects who received DUPIXENT. Conjunctivitis was the most frequently reported eye disorder. Most subjects with conjunctivitis recovered or were recovering during the treatment period. Among asthma subjects the frequency of conjunctivitis was similar between DUPIXENT and placebo [see Adverse Reactions (6.1)]. Keratitis was reported in <1% of the DUPIXENT group (1 per 100 subject-years) and in 0% of the placebo group (0 per 100 subject-years) in the 16-week atopic dermatitis monotherapy trials. In the 52-week DUPIXENT + topical corticosteroids (TCS) atopic dermatitis trial, keratitis was reported in 4% of the DUPIXENT + TCS group (12 per 100 subject-years) and in 0% of the placebo + TCS group (0 per 100 subject-years). Most subjects with keratitis recovered or were recovering during the treatment period. Among asthma subjects the frequency of keratitis was similar between DUPIXENT and placebo [see Adverse Reactions (6.1)]. Advise patients to report new onset or worsening eye symptoms to their healthcare provider. Patients being treated for asthma may present with serious systemic eosinophilia sometimes presenting with clinical features of eosinophilic pneumonia or vasculitis consistent with eosinophilic granulomatosis with polyangiitis, conditions which are often treated with systemic corticosteroid therapy. These events may be associated with the reduction of oral corticosteroid therapy. Physicians should be alert to vasculitic rash, worsening pulmonary symptoms, cardiac complications, and/or neuropathy presenting in their patients with eosinophilia. Cases of eosinophilic pneumonia and cases of vasculitis consistent with eosinophilic granulomatosis with polyangiitis have been reported with DUPIXENT in adult patients who participated in the asthma development program. A causal association between DUPIXENT and these conditions has not been established. DUPIXENT should not be used to treat acute asthma symptoms or acute exacerbations. Do not use DUPIXENT to treat acute bronchospasm or status asthmaticus. Patients should seek medical advice if their asthma remains uncontrolled or worsens after initiation of treatment with DUPIXENT. Do not discontinue systemic, topical, or inhaled corticosteroids abruptly upon initiation of therapy with DUPIXENT. Reductions in corticosteroid dose, if appropriate, should be gradual and performed under the direct supervision of a physician. Reduction in corticosteroid dose may be associated with systemic withdrawal symptoms and/or unmask conditions previously suppressed by systemic corticosteroid therapy. Advise atopic dermatitis patients with comorbid asthma not to adjust or stop their asthma treatments without consultation with their physicians. Patients with known helminth infections were excluded from participation in clinical studies. It is unknown if DUPIXENT will influence the immune response against helminth infections. Treat patients with pre-existing helminth infections before initiating therapy with DUPIXENT. If patients become infected while receiving treatment with DUPIXENT and do not respond to anti-helminth treatment, discontinue treatment with DUPIXENT until the infection resolves. Three randomized, double-blind, placebo-controlled, multicenter trials (Trials 1, 2, and 3) and one dose-ranging trial (Trial 4) evaluated the safety of DUPIXENT in subjects with moderate-to-severe atopic dermatitis. The safety population had a mean age of 38 years; 41% of subjects were female, 67% were white, 24% were Asian, and 6% were black; in terms of comorbid conditions, 48% of the subjects had asthma, 49% had allergic rhinitis, 37% had food allergy, and 27% had allergic conjunctivitis. In these 4 trials, 1472 subjects were treated with subcutaneous injections of DUPIXENT, with or without concomitant topical corticosteroids (TCS). A total of 739 subjects were treated with DUPIXENT for at least 1 year in the development program for moderate-to-severe atopic dermatitis. Trials 1, 2, and 4 compared the safety of DUPIXENT monotherapy to placebo through Week 16. Trial 3 compared the safety of DUPIXENT + TCS to placebo + TCS through Week 52. In DUPIXENT monotherapy trials (Trials 1, 2, and 4) through Week 16, the proportion of subjects who discontinued treatment because of adverse events was 1.9% in both the DUPIXENT 300 mg Q2W and placebo groups. Table 2 summarizes the adverse reactions that occurred at a rate of at least 1% in the DUPIXENT 300 mg Q2W monotherapy groups, and in the DUPIXENT + TCS group, all at a higher rate than in their respective comparator groups during the first 16 weeks of treatment. Conjunctivitis cluster includes conjunctivitis, allergic conjunctivitis, bacterial conjunctivitis, viral conjunctivitis, giant papillary conjunctivitis, eye irritation, and eye inflammation. Keratitis cluster includes keratitis, ulcerative keratitis, allergic keratitis, atopic keratoconjunctivitis, and ophthalmic herpes simplex. Other herpes simplex virus infection cluster includes herpes simplex, genital herpes, herpes simplex otitis externa, and herpes virus infection, but excludes eczema herpeticum. 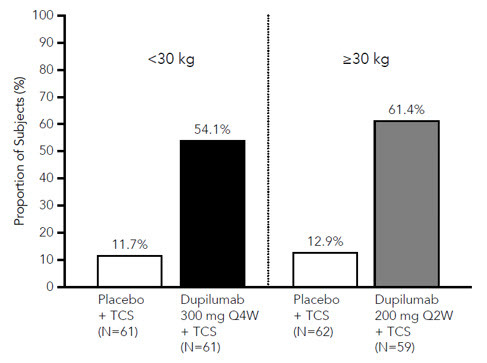 In the DUPIXENT with concomitant TCS trial (Trial 3) through Week 52, the proportion of subjects who discontinued treatment because of adverse events was 1.8% in DUPIXENT 300 mg Q2W + TCS group and 7.6% in the placebo + TCS group. Two subjects discontinued DUPIXENT because of adverse reactions: atopic dermatitis (1 subject) and exfoliative dermatitis (1 subject). The safety profile of DUPIXENT + TCS through Week 52 was generally consistent with the safety profile observed at Week 16. The safety of DUPIXENT was assessed in a trial of 250 subjects 12 to 17 years of age with moderate-to-severe atopic dermatitis (Trial 6). The safety profile of DUPIXENT in these subjects through Week 16 was similar to the safety profile from studies in adults with atopic dermatitis. The long-term safety of DUPIXENT was assessed in an open-label extension study in subjects 12 to 17 years of age with moderate-to-severe atopic dermatitis (Trial 7). 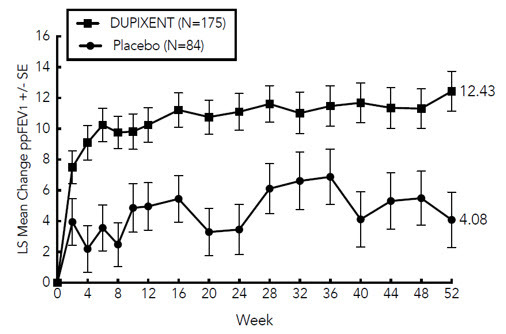 The safety profile of DUPIXENT in subjects followed through Week 52 was similar to the safety profile observed at Week 16 in Trial 6. The long-term safety profile of DUPIXENT observed in adolescents was consistent with that seen in adults with atopic dermatitis. A total of 2888 adult and adolescent subjects with moderate-to-severe asthma (AS) were evaluated in 3 randomized, placebo-controlled, multicenter trials of 24 to 52 weeks duration (AS Trials 1, 2, and 3). Of these, 2678 had a history of 1 or more severe exacerbations in the year prior to enrollment despite regular use of medium to high-dose inhaled corticosteroids plus an additional controller(s) (AS Trials 1 and 2). A total of 210 subjects with oral corticosteroid-dependent asthma receiving high-dose inhaled corticosteroids plus up to two additional controllers were enrolled (AS Trial 3). The safety population (AS Trials 1 and 2) was 12-87 years of age, of which 63% were female, and 82% were white. DUPIXENT 200 mg or 300 mg was administered subcutaneously Q2W, following an initial dose of 400 mg or 600 mg, respectively. In AS Trials 1 and 2, the proportion of subjects who discontinued treatment due to adverse events was 4% of the placebo group, 3% of the DUPIXENT 200 mg Q2W group, and 6% of the DUPIXENT 300 mg Q2W group. Table 3 summarizes the adverse reactions that occurred at a rate of at least 1% in subjects treated with DUPIXENT and at a higher rate than in their respective comparator groups in Asthma Trials 1 and 2. Injection site reactions were most common with the loading (initial) dose. The safety profile of DUPIXENT through Week 52 was generally consistent with the safety profile observed at Week 24. During the 52-week treatment period of concomitant therapy atopic dermatitis trial (Trial 3), conjunctivitis was reported in 16% of the DUPIXENT 300 mg Q2W + TCS group (20 per 100 subject-years) and in 9% of the placebo + TCS group (10 per 100 subject-years). Among asthma subjects, the frequency of conjunctivitis was similar between DUPIXENT and placebo [see Warnings and Precautions (5.2)]. The rate of eczema herpeticum was similar in the placebo and DUPIXENT groups in the atopic dermatitis trials. Herpes zoster was reported in <0.1% of the DUPIXENT groups (<1 per 100 subject-years) and in <1% of the placebo group (1 per 100 subject-years) in the 16-week atopic dermatitis monotherapy trials. In the 52-week DUPIXENT + TCS atopic dermatitis trial, herpes zoster was reported in 1% of the DUPIXENT + TCS group (1 per 100 subject-years) and 2% of the placebo + TCS group (2 per 100 subject-years). Among asthma subjects the frequency of herpes zoster was similar between DUPIXENT and placebo. Hypersensitivity reactions were reported in <1% of DUPIXENT-treated subjects. These included serum sickness reaction, serum sickness-like reaction, generalized urticaria, rash, erythema nodosum, and anaphylaxis [see Contraindications (4), Warnings and Precautions (5.1), and Adverse Reactions (6.2)]. DUPIXENT-treated subjects had a greater initial increase from baseline in blood eosinophil count compared to subjects treated with placebo. In subjects with atopic dermatitis, the mean and median increases in blood eosinophils from baseline to Week 4 were 100 and 0 cells/mcL respectively. In subjects with asthma, the mean and median increases in blood eosinophils from baseline to Week 4 were 130 and 10 cells/mcL respectively. The incidence of treatment-emergent eosinophilia (≥500 cells/mcL) was similar in DUPIXENT and placebo groups. Treatment-emergent eosinophilia (≥5,000 cells/mcL) was reported in <2% of DUPIXENT-treated patients and <0.5% in placebo-treated patients. Blood eosinophil counts declined to near baseline levels during study treatment [see Warnings and Precautions (5.3)]. 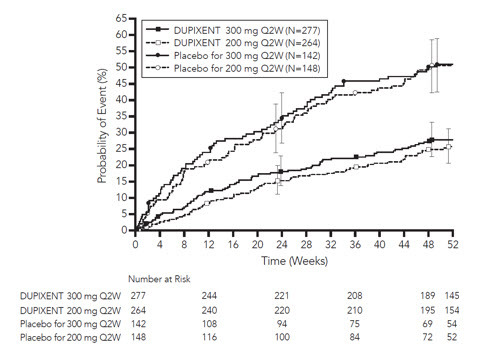 In the 1-year placebo controlled trial in subjects with asthma (AS Trial 2), cardiovascular thromboembolic events (cardiovascular deaths, non-fatal myocardial infarctions, and non-fatal strokes) were reported in 1 (0.2%) of the DUPIXENT 200 mg Q2W group, 4 (0.6%) of the DUPIXENT 300 mg Q2W group, and 2 (0.3%) of the placebo group. In the 1-year placebo controlled trial in subjects with atopic dermatitis (Trial 3), cardiovascular thromboembolic events (cardiovascular deaths, non-fatal myocardial infarctions, and non-fatal strokes) were reported in 1 (0.9%) of the DUPIXENT + TCS 300 mg Q2W group, 0 (0.0%) of the DUPIXENT + TCS 300 mg QW group, and 1 (0.3%) of the placebo + TCS group. As with all therapeutic proteins, there is a potential for immunogenicity. The detection of antibody formation is highly dependent on the sensitivity and specificity of the assay. Additionally, the observed incidence of antibody (including neutralizing antibody) positivity in an assay may be influenced by several factors, including assay methodology, sample handling, timing of sample collection, concomitant medications, and underlying disease. For these reasons, comparison of the incidence of antibodies to dupilumab in the studies described below with the incidence of antibodies in other studies or to other products may be misleading. 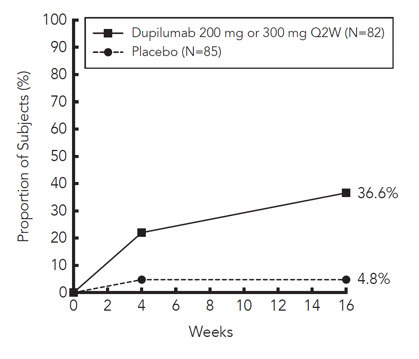 Approximately 6% of subjects with atopic dermatitis or asthma who received DUPIXENT 300 mg Q2W for 52 weeks developed antibodies to dupilumab; approximately 2% exhibited persistent ADA responses, and approximately 2% had neutralizing antibodies. Approximately 9% of subjects with asthma who received DUPIXENT 200 mg Q2W for 52 weeks developed antibodies to dupilumab; approximately 4% exhibited persistent ADA responses, and approximately 4% had neutralizing antibodies. Approximately 5% of subjects in the placebo groups in the 52-week studies were positive for antibodies to DUPIXENT; approximately 2% exhibited persistent ADA responses, and approximately 1% had neutralizing antibodies. Approximately 16% of adolescent subjects with atopic dermatitis who received DUPIXENT 300 mg or 200 mg Q2W for 16 weeks developed antibodies to dupilumab; approximately 3% exhibited persistent ADA responses, and approximately 5% had neutralizing antibodies. Approximately 4% of adolescent subjects with atopic dermatitis in the placebo group were positive for antibodies to DUPIXENT; approximately 1% exhibited persistent ADA responses, and approximately 1% had neutralizing antibodies. The antibody titers detected in both DUPIXENT and placebo subjects were mostly low. In subjects who received DUPIXENT, development of high titer antibodies to dupilumab was associated with lower serum dupilumab concentrations [see Clinical Pharmacology (12.3)]. Two subjects who experienced high titer antibody responses developed serum sickness or serum sickness-like reactions during DUPIXENT therapy [see Warnings and Precautions (5.1)]. Avoid use of live vaccines in patients treated with DUPIXENT. Immune responses to vaccination were assessed in a study in which subjects with atopic dermatitis were treated once weekly for 16 weeks with 300 mg of dupilumab (twice the recommended dosing frequency). After 12 weeks of DUPIXENT administration, subjects were vaccinated with a Tdap vaccine (Adacel®) and a meningococcal polysaccharide vaccine (Menomune®). Antibody responses to tetanus toxoid and serogroup C meningococcal polysaccharide were assessed 4 weeks later. Antibody responses to both tetanus vaccine and meningococcal polysaccharide vaccine were similar in dupilumab-treated and placebo-treated subjects. Immune responses to the other active components of the Adacel and Menomune vaccines were not assessed. There is a pregnancy exposure registry that monitors pregnancy outcomes in women exposed to DUPIXENT during pregnancy. Please contact 1-877-311-8972 or go to https://mothertobaby.org/ongoing-study/dupixent/ to enroll in or to obtain information about the registry. Available data from case reports and case series with DUPIXENT use in pregnant women have not identified a drug-associated risk of major birth defects, miscarriage, or adverse maternal or fetal outcomes. Human IgG antibodies are known to cross the placental barrier; therefore, DUPIXENT may be transmitted from the mother to the developing fetus. There are adverse effects on maternal and fetal outcomes associated with asthma in pregnancy (see Clinical Considerations). In an enhanced pre- and post-natal developmental study, no adverse developmental effects were observed in offspring born to pregnant monkeys after subcutaneous administration of a homologous antibody against interleukin-4-receptor alpha (IL-4Rα) during organogenesis through parturition at doses up to 10-times the maximum recommended human dose (MRHD) (see Data). The estimated background risk of major birth defects and miscarriage for the indicated populations are unknown. All pregnancies have a background risk of birth defect, loss or other adverse outcomes. In the U.S. general population, the estimated background risk of major birth defects and miscarriage in clinically recognized pregnancies is 2% to 4% and 15% to 20%, respectively. In an enhanced pre- and post-natal development toxicity study, pregnant cynomolgus monkeys were administered weekly subcutaneous doses of homologous antibody against IL-4Rα up to 10 times the MRHD (on a mg/kg basis of 100 mg/kg/week) from the beginning of organogenesis to parturition. No treatment-related adverse effects on embryo-fetal toxicity or malformations, or on morphological, functional, or immunological development were observed in the infants from birth through 6 months of age. There are no data on the presence of dupilumab in human milk, the effects on the breastfed infant, or the effects on milk production. Maternal IgG is known to be present in human milk. The effects of local gastrointestinal exposure and limited systemic exposure to dupilumab on the breastfed infant are unknown. The developmental and health benefits of breastfeeding should be considered along with the mother's clinical need for DUPIXENT and any potential adverse effects on the breastfed child from DUPIXENT or from the underlying maternal condition. The safety and efficacy of DUPIXENT have been established in pediatric patients 12 years of age and older with moderate-to-severe atopic dermatitis. A total of 251 adolescents ages 12 to 17 years old with moderate-to-severe atopic dermatitis were enrolled in Trial 6. The safety and efficacy were generally consistent between adolescents and adults [see Adverse Reactions (6.1) and Clinical Studies (14.1)]. Safety and efficacy in pediatric patients (<12 years of age) with atopic dermatitis have not been established. A total of 107 adolescents aged 12 to 17 years with moderate to severe asthma were enrolled in AS Trial 2 and received either 200 mg (N=21) or 300 mg (N=18) DUPIXENT (or matching placebo either 200 mg [N=34] or 300 mg [N=34]) Q2W. Asthma exacerbations and lung function were assessed in both adolescents and adults. For both the 200 mg and 300 mg Q2W doses, improvements in FEV1 (LS mean change from baseline at Week 12) were observed (0.36 L and 0.27 L, respectively). For the 200 mg Q2W dose, subjects had a reduction in the rate of severe exacerbations that was consistent with adults. Safety and efficacy in pediatric patients (<12 years of age) with asthma have not been established. Dupilumab exposure was higher in adolescent patients than that in adults at the respective dose level which was mainly accounted for by difference in body weight [see Clinical Pharmacology (12.3)]. The adverse event profile in adolescents was generally similar to the adults [see Adverse Reactions (6.1)]. Of the 1472 subjects with atopic dermatitis exposed to DUPIXENT in a dose-ranging study and placebo-controlled trials, 67 subjects were 65 years or older. Although no differences in safety or efficacy were observed between older and younger subjects, the number of subjects aged 65 and over is not sufficient to determine whether they respond differently from younger subjects [see Clinical Pharmacology (12.3)]. Of the 1977 subjects with asthma exposed to DUPIXENT, a total of 240 subjects were 65 years or older. Efficacy and safety in this age group was similar to the overall study population. There is no specific treatment for DUPIXENT overdose. In the event of overdosage, monitor the patient for any signs or symptoms of adverse reactions and institute appropriate symptomatic treatment immediately. Dupilumab, an interleukin-4 receptor alpha antagonist, is a human monoclonal antibody of the IgG4 subclass that binds to the IL-4Rα subunit and inhibits IL-4 and IL-13 signaling. Dupilumab has an approximate molecular weight of 147 kDa. Dupilumab is produced by recombinant DNA technology in Chinese Hamster Ovary cell suspension culture. DUPIXENT (dupilumab) Injection is supplied as a sterile, preservative-free, clear to slightly opalescent, colorless to pale yellow solution for subcutaneous injection. 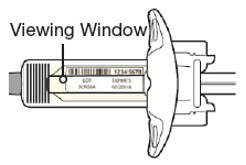 DUPIXENT is provided as a single-dose pre-filled syringe with needle shield in a siliconized Type-1 clear glass syringe. The needle cap is not made with natural rubber latex. Each 300 mg pre-filled syringe delivers 300 mg dupilumab in 2 mL which also contains L-arginine hydrochloride (10.5 mg), L-histidine (6.2 mg), polysorbate 80 (4 mg), sodium acetate (2 mg), sucrose (100 mg), and water for injection, pH 5.9. Each 200 mg pre-filled syringe delivers 200 mg dupilumab in 1.14 mL which also contains L-arginine hydrochloride (12 mg), L-histidine (3.5 mg), polysorbate 80 (2.3 mg), sodium acetate (1.2 mg), sucrose (57 mg), and water for injection, pH 5.9. Dupilumab is a human monoclonal IgG4 antibody that inhibits interleukin-4 (IL-4) and interleukin-13 (IL-13) signaling by specifically binding to the IL-4Rα subunit shared by the IL-4 and IL-13 receptor complexes. Dupilumab inhibits IL-4 signaling via the Type I receptor and both IL-4 and IL-13 signaling through the Type II receptor. Inflammation is an important component in the pathogenesis of asthma and atopic dermatitis. Multiple cell types that express IL-4Rα (e.g., mast cells, eosinophils, macrophages, lymphocytes, epithelial cells, goblet cells) and inflammatory mediators (e.g., histamine, eicosanoids, leukotrienes, cytokines, chemokines) are involved in inflammation. Blocking IL-4Rα with dupilumab inhibits IL-4 and IL-13 cytokine-induced inflammatory responses, including the release of proinflammatory cytokines, chemokines, nitric oxide, and IgE; however, the mechanism of dupilumab action in asthma has not been definitively established. Consistent with inhibition of IL-4 and IL-13 signaling, dupilumab treatment markedly decreased fractional exhaled nitric oxide (FeNO) and circulating concentrations of eotaxin-3, total IgE, allergen specific IgE, TARC, and periostin in asthma subjects relative to placebo. These reductions in biomarkers were comparable for the 300 mg Q2W and 200 mg Q2W regimens. These markers were near maximal suppression after 2 weeks of treatment, except for IgE which declined more slowly. These effects were sustained throughout treatment. The median percent reduction from baseline in total IgE concentrations with dupilumab treatments was 52% at Week 24 (AS Trial 1) and 70% at Week 52 (AS Trial 2). For FeNO, the mean percent reduction from baseline at Week 2 was 35% and 24% in AS Trials 1 and 2 respectively, and in the overall safety population, the mean FeNO level decreased to 20 ppb. The pharmacokinetics of dupilumab is similar in subjects with atopic dermatitis and asthma. Following an initial subcutaneous (SC) dose of 600 mg or 400 mg, dupilumab reached peak mean ± SD concentrations (Cmax) of 70.1±24.1 mcg/mL or 41.8±12.4 mcg/mL, respectively, by approximately 1 week post dose. Steady-state concentrations were achieved by Week 16 following the administration of 600 mg starting dose and 300 mg dose either weekly (twice the recommended dosing frequency) or Q2W, or 400 mg starting dose and 200 mg dose Q2W. Across clinical trials, the mean ± SD steady-state trough concentrations ranged from 60.3±35.1 mcg/mL to 79.9±41.4 mcg/mL for 300 mg administered Q2W, from 173±75.9 mcg/mL to 193±77.0 mcg/mL for 300 mg administered weekly, and from 29.2±18.7 to 36.5±22.2 mg/L for 200 mg administered Q2W. The bioavailability of dupilumab following a SC dose is similar between AD and asthma patients, ranging between 61% and 64%. The estimated total volume of distribution was approximately 4.8±1.3 L.
The metabolic pathway of dupilumab has not been characterized. As a human monoclonal IgG4 antibody, dupilumab is expected to be degraded into small peptides and amino acids via catabolic pathways in the same manner as endogenous IgG. After the last steady-state dose of 300 mg Q2W, 300 mg QW, or 200 mg Q2W dupilumab, the median times to non-detectable concentration (<78 ng/mL) are 10-11, 13, and 9 weeks, respectively. Dupilumab exhibited nonlinear target-mediated pharmacokinetics with exposures increasing in a greater than dose-proportional manner. The systemic exposure increased by 30-fold when the dose increased 8-fold following a single dose of dupilumab from 75 mg to 600 mg (i.e., 0.25-times to 2-times the recommended dose). Dupilumab trough concentrations were lower in subjects with higher body weight. Based on population pharmacokinetic analysis, age did not affect dupilumab clearance. Development of antibodies to dupilumab was associated with lower serum dupilumab concentrations. A few subjects who had high antibody titers also had no detectable serum dupilumab concentrations. In subjects who are 65 years and older, the mean ±SD steady-state trough concentrations of dupilumab were 69.4±31.4 mcg/mL and 166±62.3 mcg/mL, respectively, for 300 mg administered Q2W and weekly, and 39.7±21.7 mcg/mL for 200 mg administered Q2W. For adolescents 12 to 17 years of age with atopic dermatitis receiving every other week dosing (Q2W) with either 200 mg (<60 kg) or 300 mg (≥60 kg), the mean±SD steady-state trough concentration of dupilumab was 54.5±27.0 mcg/mL. A total of 107 adolescents aged 12 to 17 years with asthma were enrolled in AS Trial 2. The mean ±SD steady-state trough concentrations of dupilumab were 107±51.6 mcg/mL and 46.7±26.9 mcg/mL, respectively, for 300 mg or 200 mg administered Q2W. No formal trial of the effect of hepatic or renal impairment on the pharmacokinetics of dupilumab was conducted. An effect of dupilumab on the PK of co-administered medications is not expected. Based on the population analysis, commonly co-administered medications had no effect on DUPIXENT pharmacokinetics in patients with moderate-to-severe asthma. The effects of dupilumab on the pharmacokinetics of midazolam (metabolized by CYP3A4), warfarin (metabolized by CYP2C9), omeprazole (metabolized by CYP2C19), metoprolol (metabolized by CYP2D6), and caffeine (metabolized by CYP1A2) were evaluated in a study with 12-13 evaluable subjects with atopic dermatitis (a SC loading dose of 600 mg followed by 300 mg SC weekly for six weeks). No clinically significant changes in AUC were observed. The largest effect was observed for metoprolol (CYP2D6) with an increase in AUC of 29%. Animal studies have not been conducted to evaluate the carcinogenic or mutagenic potential of dupilumab. No effects on fertility parameters such as reproductive organs, menstrual cycle length, or sperm analysis were observed in sexually mature mice that were subcutaneously administered a homologous antibody against IL-4Rα at doses up to 200 mg/kg/week. Three randomized, double-blind, placebo-controlled trials (Trials 1, 2, and 3; NCT02277743, 02277769, and 02260986 respectively) enrolled a total of 2119 subjects 18 years of age and older with moderate-to-severe atopic dermatitis (AD) not adequately controlled by topical medication(s). Disease severity was defined by an Investigator's Global Assessment (IGA) score ≥3 in the overall assessment of AD lesions on a severity scale of 0 to 4, an Eczema Area and Severity Index (EASI) score ≥16 on a scale of 0 to 72, and a minimum body surface area involvement of ≥10%. At baseline, 59% of subjects were male, 67% were white, 52% of subjects had a baseline IGA score of 3 (moderate AD), and 48% of subjects had a baseline IGA of 4 (severe AD). The baseline mean EASI score was 33 and the baseline weekly averaged Peak Pruritus Numeric Rating Scale (NRS) was 7 on a scale of 0-10. In all three trials, subjects in the DUPIXENT group received subcutaneous injections of DUPIXENT 600 mg at Week 0, followed by 300 mg every other week (Q2W). In the monotherapy trials (Trials 1 and 2), subjects received DUPIXENT or placebo for 16 weeks. In the concomitant therapy trial (Trial 3), subjects received DUPIXENT or placebo with concomitant topical corticosteroids (TCS) and as needed topical calcineurin inhibitors for problem areas only, such as the face, neck, intertriginous and genital areas for 52 weeks. All three trials assessed the primary endpoint, the change from baseline to Week 16 in the proportion of subjects with an IGA 0 (clear) or 1 (almost clear) and at least a 2-point improvement. Other endpoints included the proportion of subjects with EASI-75 (improvement of at least 75% in EASI score from baseline), and reduction in itch as defined by at least a 4-point improvement in the Peak Pruritus NRS from baseline to Week 16. The results of the DUPIXENT monotherapy trials (Trials 1 and 2) and the DUPIXENT with concomitant TCS trial (Trial 3) are presented in Table 4. Full Analysis Set (FAS) includes all subjects randomized. Responder was defined as a subject with an IGA 0 or 1 ("clear" or "almost clear") and a reduction of ≥2 points on a 0-4 IGA scale. Subjects who received rescue treatment or with missing data were considered as non-responders. In the primary analyses of the efficacy endpoints, subjects who received rescue treatment or with missing data were considered non-responders. In Trial 3, of the 421 subjects, 353 had been on study for 52 weeks at the time of data analysis. Of these 353 subjects, responders at Week 52 represent a mixture of subjects who maintained their efficacy from Week 16 (e.g., 53% of DUPIXENT IGA 0 or 1 responders at Week 16 remained responders at Week 52) and subjects who were non-responders at Week 16 who later responded to treatment (e.g., 24% of DUPIXENT IGA 0 or 1 non-responders at Week 16 became responders at Week 52). Results of supportive analyses of the 353 subjects in the DUPIXENT with concomitant TCS trial (Trial 3) are presented in Table 5. In Trial 3, of the 421 randomized and treated subjects, 68 subjects (16%) had not been on study for 52 weeks at the time of data analysis. Treatment effects in subgroups (weight, age, gender, race, and prior treatment, including immunosuppressants) in Trials 1, 2, and 3 were generally consistent with the results in the overall study population. 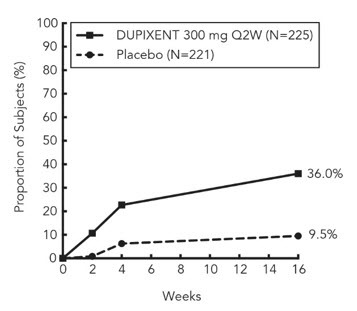 In Trials 1, 2, and 3, a third randomized treatment arm of DUPIXENT 300 mg QW did not demonstrate additional treatment benefit over DUPIXENT 300 mg Q2W. Subjects in Trials 1 and 2 who had an IGA 0 or 1 with a reduction of ≥2 points were re-randomized into Trial 5. Trial 5 evaluated multiple DUPIXENT monotherapy dose regimens for maintaining treatment response. The study included subjects randomized to continue with DUPIXENT 300 mg Q2W (62 subjects) or switch to placebo (31 subjects) for 36 weeks. IGA 0 or 1 responses at Week 36 were as follows: 33 (53%) in the Q2W group and 3 (10%) in the placebo group. The efficacy and safety of DUPIXENT monotherapy in adolescent subjects was evaluated in a multicenter, randomized, double-blind, placebo-controlled trial (Trial 6; NCT03054428) in 251 adolescent subjects 12 to 17 years of age, with moderate-to-severe AD defined by an IGA score ≥3 (scale of 0 to 4), an EASI score ≥16 (scale of 0 to 72), and a minimum BSA involvement of ≥10%. Eligible subjects enrolled into this trial had previous inadequate response to topical medication. Subjects in the DUPIXENT group with baseline weight of <60 kg received an initial dose of 400 mg at Week 0, followed by 200 mg Q2W for 16 weeks. Subjects with baseline weight of ≥60 kg received an initial dose of 600 mg at Week 0, followed by 300 mg Q2W for 16 weeks. Subjects were permitted to receive rescue treatment at the discretion of the investigator. Subjects who received rescue treatment were considered non-responders. In Trial 6, the mean age was 14.5 years, the median weight was 59.4 kg, 41% of subjects were female, 63% were White, 15% were Asian, and 12% were Black. At baseline 46% of subjects had an IGA score of 3 (moderate AD), 54% had an IGA score of 4 (severe AD), the mean BSA involvement was 57%, and 42% had received prior systemic immunosuppressants. Also, at baseline the mean EASI score was 36, and the weekly averaged Peak Pruritus NRS was 8 on a scale of 0-10. Overall, 92% of subjects had at least one co-morbid allergic condition; 66% had allergic rhinitis, 54% had asthma, and 61% had food allergies. The primary endpoint was the proportion of subjects with an IGA 0 (clear) or 1 (almost clear) and at least a 2-point improvement from baseline to Week 16. Other evaluated outcomes included the proportion of subjects with EASI-75 or EASI-90 (improvement of at least 75% or 90% in EASI from baseline, respectively), and reduction in itch as measured by the Peak Pruritus NRS (≥4-point improvement). The efficacy results at Week 16 for Trial 6 are presented in Table 6. At Week 0, subjects received 400 mg (baseline weight <60 kg) or 600 mg (baseline weight ≥60 kg) of DUPIXENT. Subjects who received rescue treatment or with missing data were considered as non-responders (59% and 21% in the placebo and DUPIXENT arms, respectively). 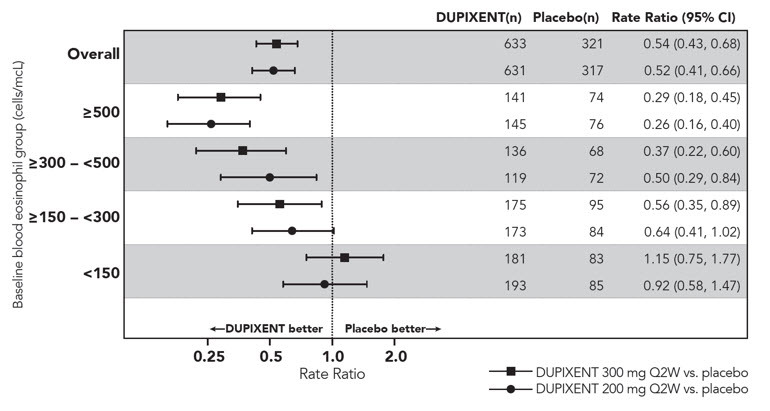 A greater proportion of subjects randomized to DUPIXENT achieved an improvement in the Peak Pruritus NRS compared to placebo (defined as ≥4-point improvement at Week 4). See Figure 2. The asthma development program included three randomized, double-blind, placebo-controlled, parallel-group, multi-center trials (AS Trials 1, 2, and 3) of 24 to 52 weeks in treatment duration which enrolled a total of 2888 subjects (12 years of age and older). Subjects enrolled in AS Trials 1 and 2 were required to have a history of 1 or more asthma exacerbations that required treatment with systemic corticosteroids or emergency department visit or hospitalization for the treatment of asthma in the year prior to trial entry. Subjects enrolled in AS Trial 3 required dependence on daily oral corticosteroids in addition to regular use of high-dose inhaled corticosteroids plus an additional controller(s). In all 3 trials, subjects were enrolled without requiring a minimum baseline blood eosinophil count. In AS Trials 2 and 3 subjects with screening blood eosinophil level of >1500 cells/mcL (<1.3%) were excluded. DUPIXENT was administered as add-on to background asthma treatment. Subjects continued background asthma therapy throughout the duration of the studies, except in AS Trial 3 in which OCS dose was tapered as described below. AS Trial 1 was a 24-week dose-ranging study which included 776 subjects (18 years of age and older). 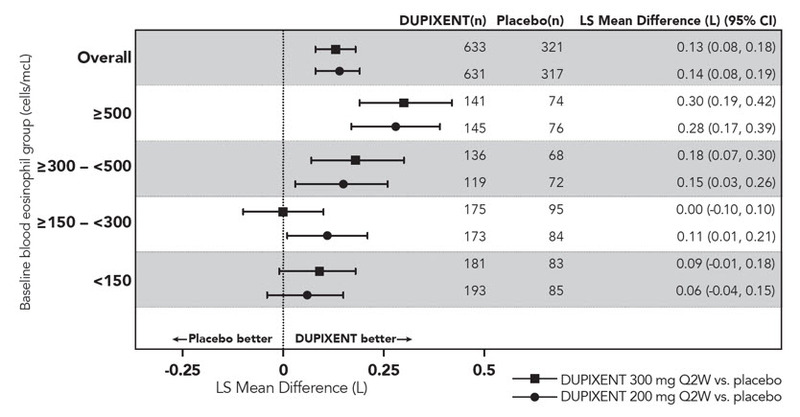 DUPIXENT compared with placebo was evaluated in adult subjects with moderate to severe asthma on a medium or high-dose inhaled corticosteroid and a long acting beta agonist. Subjects were randomized to receive either 200 mg (N=150) or 300 mg (N=157) DUPIXENT every other week (Q2W) or 200 mg (N=154) or 300 mg (N=157) DUPIXENT every 4 weeks following an initial dose of 400 mg, 600 mg or placebo (N=158), respectively. The primary endpoint was mean change from baseline to Week 12 in FEV1 (L) in subjects with baseline blood eosinophils ≥300 cells/mcL. Other endpoints included percent change from baseline in FEV1 and annualized rate of severe asthma exacerbation events during the 24-week placebo controlled treatment period. Results were evaluated in the overall population and subgroups based on baseline blood eosinophil count (≥300 cells/mcL and <300 cells/mcL). Additional secondary endpoints included responder rates in the patient reported Asthma Control Questionnaire (ACQ-5) and Asthma Quality of Life Questionnaire, Standardized Version (AQLQ(S)) scores. AS Trial 2 was a 52-week study which included 1902 subjects (12 years of age and older). DUPIXENT compared with placebo was evaluated in 107 adolescent and 1795 adult subjects with moderate-to-severe asthma on a medium or high-dose inhaled corticosteroid (ICS) and a minimum of one and up to two additional controller medications. 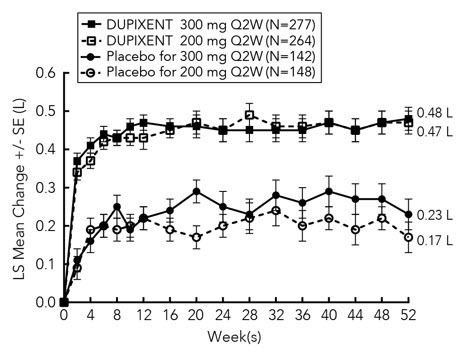 Subjects were randomized to receive either 200 mg (N=631) or 300 mg (N=633) DUPIXENT Q2W (or matching placebo for either 200 mg [N=317] or 300 mg [N=321] Q2W) following an initial dose of 400 mg, 600 mg or placebo respectively. The primary endpoints were the annualized rate of severe exacerbation events during the 52-week placebo controlled period and change from baseline in pre-bronchodilator FEV1 at Week 12 in the overall population (unrestricted by minimum baseline blood eosinophils count). Additional secondary endpoints included annualized severe exacerbation rates and FEV1 in patients with different baseline levels of blood eosinophils as well as responder rates in the ACQ-5 and AQLQ(S) scores. AS Trial 3 was a 24-week oral corticosteroid-reduction study in 210 subjects with asthma who required daily oral corticosteroids in addition to regular use of high dose inhaled corticosteroids plus an additional controller. 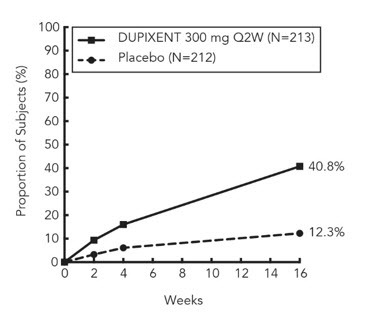 After optimizing the OCS dose during the screening period, subjects received 300 mg DUPIXENT (N=103) or placebo (N=107) once Q2W for 24 weeks following an initial dose of 600 mg or placebo. Subjects continued to receive their existing asthma medicine during the study; however their OCS dose was reduced every 4 weeks during the OCS reduction phase (Week 4-20), as long as asthma control was maintained. The primary endpoint was the percent reduction of oral corticosteroid dose at Weeks 20 to 24 compared with the baseline dose, while maintaining asthma control in the overall population (unrestricted by minimum baseline blood eosinophils count). Additional secondary endpoints included the annualized rate of severe exacerbation events during treatment period and responder rate in the ACQ-5 and AQLQ(S) scores. The demographics and baseline characteristics of these 3 trials are provided in Table 7 below. AS Trials 1 and 2 evaluated the frequency of severe asthma exacerbations defined as deterioration of asthma requiring the use of systemic corticosteroids for at least 3 days or hospitalization or emergency room visit due to asthma that required systemic corticosteroids. In the primary analysis population (subjects with baseline blood eosinophil count of ≥300 cells/mcL in AS Trial 1 and the overall population in AS Trial 2), subjects receiving either DUPIXENT 200 mg or 300 mg Q2W had significant reductions in the rate of asthma exacerbations compared to placebo. In the overall population in AS Trial 2, the rate of severe exacerbations was 0.46 and 0.52 for DUPIXENT 200 mg Q2W and 300 mg Q2W, respectively, compared to matched placebo rates of 0.87 and 0.97. The rate ratio of severe exacerbations compared to placebo was 0.52 (95% CI: 0.41, 0.66) and 0.54 (95% CI: 0.43, 0.68) for DUPIXENT 200 mg Q2W and 300 mg Q2W, respectively. Results in subjects with baseline blood eosinophil counts ≥ 300 cells/mcL in AS Trials 1 and 2 are shown in Table 8. Response rates by baseline blood eosinophils for AS Trial 2 are shown in Figure 3. Prespecified subgroup analyses of AS Trials 1 and 2 demonstrated that there were greater reductions in severe exacerbations in subjects with higher baseline blood eosinophil levels. In AS Trial 2, reductions in exacerbations were significant in the subgroup of subjects with baseline blood eosinophils ≥ 150 cells/mcL. In subjects with baseline blood eosinophil count < 150 cells/mcL, similar severe exacerbation rates were observed between DUPIXENT and placebo. In AS Trial 2, the estimated rate ratio of exacerbations leading to hospitalizations and/or emergency room visits versus placebo was 0.53 (95% CI: 0.28, 1.03) and 0.74 (95% CI: 0.32, 1.70) with DUPIXENT 200 mg or 300 mg Q2W, respectively. The time to first exacerbation was longer for the subjects receiving DUPIXENT compared to placebo in AS Trial 2 (Figure 4). Significant increases in pre-bronchodilator FEV1 were observed at Week 12 for AS Trials 1 and 2 in the primary analysis populations (subjects with baseline blood eosinophil count of ≥ 300 cells/mcL in AS Trial 1 and the overall population in AS Trial 2). In the overall population in AS Trial 2, the FEV1 LS mean change from baseline was 0.32 L (21%) and 0.34 L (23%) for DUPIXENT 200 mg Q2W and 300 mg Q2W, respectively, compared to matched placebo means of 0.18 L (12%) and 0.21 L (14%). The mean treatment difference versus placebo was 0.14 L (95% CI: 0.08, 0.19) and 0.13 L (95% CI: 0.08, 0.18) for DUPIXENT 200 mg Q2W and 300 mg Q2W, respectively. Results in subjects with baseline blood eosinophil counts ≥ 300 cells/mcL in AS Trials 1 and 2 are shown in Table 9. Improvements in FEV1 by baseline blood eosinophils for AS Trial 2 are shown in Figure 5. Subgroup analysis of AS Trials 1 and 2 demonstrated greater improvement in subjects with higher baseline blood eosinophils. Mean changes in FEV1 over time in AS Trial 2 are shown in Figure 6. ACQ-5 and AQLQ(S) were assessed in AS Trial 2 at 52 weeks. The responder rate was defined as an improvement in score of 0.5 or more (scale range 0-6 for ACQ-5 and 1-7 for AQLQ(S)). The ACQ-5 responder rate for DUPIXENT 200 mg and 300 mg Q2W in the overall population was 69% vs 62% placebo (odds ratio 1.37; 95% CI: 1.01, 1.86) and 69% vs 63% placebo (odds ratio 1.28; 95% CI: 0.94, 1.73), respectively; and the AQLQ(S) responder rates were 62% vs 54% placebo (odds ratio 1.61; 95% CI: 1.17, 2.21) and 62% vs 57% placebo (odds ratio 1.33; 95% CI: 0.98, 1.81), respectively. The ACQ-5 responder rate for DUPIXENT 200 mg and 300 mg Q2W in subjects with baseline blood eosinophils ≥300 cells/mcL was 75% vs 67% placebo (odds ratio: 1.46; 95% CI: 0.90, 2.35) and 71% vs 64% placebo (odds ratio: 1.39; 95% CI: 0.88, 2.19), respectively; and the AQLQ(S) responder rates were 71% vs 55% placebo (odds ratio: 2.02; 95% CI: 1.24, 3.32) and 65% vs 55% placebo (odds ratio: 1.79; 95% CI: 1.13, 2.85), respectively. AS Trial 3 evaluated the effect of DUPIXENT on reducing the use of maintenance oral corticosteroids. The baseline mean oral corticosteroid dose was 12 mg in the placebo group and 11 mg in the group receiving DUPIXENT. The primary endpoint was the percent reduction from baseline of the final oral corticosteroid dose at Week 24 while maintaining asthma control. Compared with placebo, subjects receiving DUPIXENT achieved greater reductions in daily maintenance oral corticosteroid dose, while maintaining asthma control. The mean percent reduction in daily OCS dose from baseline was 70% (median 100%) in subjects receiving DUPIXENT (95% CI: 60%, 80%) compared to 42% (median 50%) in subjects receiving placebo (95% CI: 33%, 51%). Reductions of 50% or higher in the OCS dose were observed in 82 (80%) subjects receiving DUPIXENT compared to 57 (53%) in those receiving placebo. The proportion of subjects with a mean final dose less than 5 mg at Weeks 24 was 72% for DUPIXENT and 37% for placebo (odds ratio 4.48 95% CI: 2.39, 8.39). A total of 54 (52%) subjects receiving DUPIXENT versus 31 (29%) subjects in the placebo group had a 100% reduction in their OCS dose. In this 24-week trial, asthma exacerbations (defined as a temporary increase in oral corticosteroid dose for at least 3 days) were lower in subjects receiving DUPIXENT compared with those receiving placebo (annualized rate 0.65 and 1.60 for the DUPIXENT and placebo group, respectively; rate ratio 0.41 [95% CI 0.26, 0.63]) and improvement in pre-bronchodilator FEV1 from baseline to Week 24 was greater in subjects receiving DUPIXENT compared with those receiving placebo (LS mean difference for DUPIXENT versus placebo of 0.22 L [95% CI: 0.09 to 0.34 L]). Effects on lung function and on oral steroid and exacerbation reduction were similar irrespective of baseline blood eosinophil levels. The ACQ-5 and AQLQ(S) were also assessed in AS Trial 3 and showed improvements similar to those in AS Trial 2. DUPIXENT (dupilumab) Injection is a clear to slightly opalescent, colorless to pale yellow solution, supplied in single-dose pre-filled syringes with needle shield. Each pre-filled syringe with needle shield is designed to deliver either 300 mg of DUPIXENT in 2 mL (NDC 0024-5914-00) or 200 mg of DUPIXENT in 1.14 mL solution (NDC 0024-5918-00). DUPIXENT is sterile and preservative-free. Discard any unused portion. Store refrigerated at 36°F to 46°F (2°C to 8°C) in the original carton to protect from light. 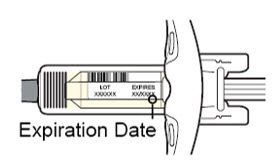 If necessary, pre-filled syringes may be kept at room temperature up to 77°F (25°C) for a maximum of 14 days. Do not store above 77°F (25°C). After removal from the refrigerator, DUPIXENT must be used within 14 days or discarded. 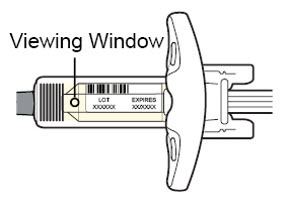 Do not expose the pre-filled syringe to heat or direct sunlight. Advise the patients and/or caregivers to read the FDA-approved patient labeling (Patient Information and Instructions for Use) before the patient starts using DUPIXENT and each time the prescription is renewed as there may be new information they need to know. There is a pregnancy exposure registry that monitors pregnancy outcomes in women exposed to DUPIXENT during pregnancy. Encourage participation in the registry. [see Use in Specific Populations (8.1)]. 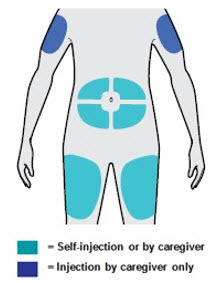 Provide proper training to patients and/or caregivers on proper subcutaneous injection technique, including aseptic technique, and the preparation and administration of DUPIXENT prior to use. 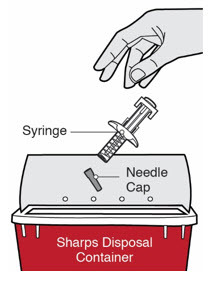 Advise patients to follow sharps disposal recommendations [see Instructions for Use]. Advise patients to discontinue DUPIXENT and to seek immediate medical attention if they experience any symptoms of systemic hypersensitivity reactions [see Warnings and Precautions (5.1)]. Advise patients to consult their healthcare provider if new onset or worsening eye symptoms develop [see Warnings and Precautions (5.2)]. Advise patients to notify their healthcare provider if they present with clinical features of eosinophilic pneumonia or vasculitis consistent with eosinophilic granulomatosis with polyangiitis [see Warnings and Precautions (5.3)]. Inform patients that DUPIXENT does not treat acute asthma symptoms or acute exacerbations. Inform patients to seek medical advice if their asthma remains uncontrolled or worsens after initiation of treatment with DUPIXENT [see Warnings and Precautions (5.4)]. Inform patients to not discontinue systemic or inhaled corticosteroids except under the direct supervision of a physician. Inform patients that reduction in corticosteroid dose may be associated with systemic withdrawal symptoms and/or unmask conditions previously suppressed by systemic corticosteroid therapy [see Warnings and Precautions (5.5)]. Advise atopic dermatitis patients with comorbid asthma not to adjust or stop their asthma treatment without talking to their physicians [see Warnings and Precautions (5.6)]. © 2019 Regeneron Pharmaceuticals, Inc. / sanofi-aventis U.S. LLC. All rights reserved. to treat people aged 12 years and older with moderate-to-severe atopic dermatitis (eczema) that is not well controlled with prescription therapies used on the skin (topical), or who cannot use topical therapies. DUPIXENT can be used with or without topical corticosteroids. with other asthma medicines for the maintenance treatment of moderate-to-severe asthma in people aged 12 years and older whose asthma is not controlled with their current asthma medicines. DUPIXENT helps prevent severe asthma attacks (exacerbations) and can improve your breathing. DUPIXENT may also help reduce the amount of oral corticosteroids you need while preventing severe asthma attacks and improving your breathing. DUPIXENT works by blocking two proteins that contribute to a type of inflammation that plays a major role in atopic dermatitis and asthma. It is not known if DUPIXENT is safe and effective in children with atopic dermatitis under 12 years of age. It is not known if DUPIXENT is safe and effective in children with asthma under 12 years of age. Do not use DUPIXENT if you are allergic to dupilumab or to any of the ingredients in DUPIXENT. See the end of this leaflet for a complete list of ingredients in DUPIXENT. have eye problems (if you also have atopic dermatitis). Pregnancy Registry. There is a pregnancy registry for women who take DUPIXENT during pregnancy. The purpose of this registry is to collect information about your health and your baby's health. You can talk to your healthcare provider or contact 1-877-311-8972 or go to https://mothertobaby.org/ongoing-study/dupixent/ to enroll in this registry or get more information. Tell your healthcare provider about all of the medicines you take, including prescription and over-the-counter medicines, vitamins, and herbal supplements. If you have asthma and are taking asthma medicines, do not change or stop your asthma medicine without talking to your healthcare provider. How should I use DUPIXENT? 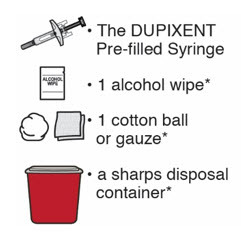 See the detailed "Instructions for Use" that comes with DUPIXENT for information on how to prepare and inject DUPIXENT and how to properly store and throw away (dispose of) used DUPIXENT pre-filled syringes. Use DUPIXENT exactly as prescribed by your healthcare provider. DUPIXENT comes as a single-dose pre-filled syringe with needle shield. DUPIXENT is given as an injection under the skin (subcutaneous injection). If your healthcare provider decides that you or a caregiver can give the injections of DUPIXENT, you or your caregiver should receive training on the right way to prepare and inject DUPIXENT. Do not try to inject DUPIXENT until you have been shown the right way by your healthcare provider. In adolescents 12 years of age and older, it is recommended that DUPIXENT be administered by or under supervision of an adult. If you miss a dose of DUPIXENT, give the injection within 7 days from the missed dose, then continue with the original schedule. If the missed dose is not given within 7 days, wait until the next scheduled dose to give your DUPIXENT injection. If you inject more DUPIXENT than prescribed, call your healthcare provider right away. Your healthcare provider may prescribe other medicines to use with DUPIXENT. Use the other prescribed medicines exactly as your healthcare provider tells you to. These are not all of the possible side effects of DUPIXENT. General information about the safe and effective use of DUPIXENT. Medicines are sometimes prescribed for purposes other than those listed in a Patient Information leaflet. Do not use DUPIXENT for a condition for which it was not prescribed. Do not give DUPIXENT to other people, even if they have the same symptoms that you have. It may harm them. You can ask your pharmacist or healthcare provider for information about DUPIXENT that is written for health professionals. Inactive ingredients: L-arginine hydrochloride, L-histidine, polysorbate 80, sodium acetate, sucrose, and water for injection. DUPIXENT® is a registered trademark of Sanofi Biotechnology / © 2019 Regeneron Pharmaceuticals, Inc. / sanofi-aventis U.S. LLC. All rights reserved. For more information about DUPIXENT, go to www.DUPIXENT.com or call 1- 844-DUPIXENT (1-844-387-4936). 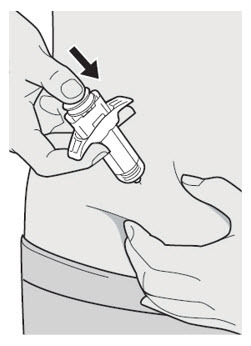 Read this Instructions for Use before using the DUPIXENT Pre-filled Syringe. Do not inject yourself or someone else until you have been shown how to inject DUPIXENT. In adolescents 12 years of age and older, it is recommended that DUPIXENT be administered by or under supervision of an adult. Your healthcare provider can show you or your caregiver how to prepare and inject a dose of DUPIXENT before you try to do it yourself the first time. Keep these instructions for future use. Call your healthcare provider if you have any questions. 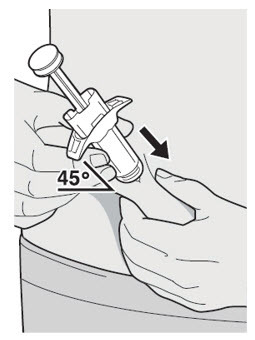 This device is a Single-Dose Pre-filled Syringe (called "DUPIXENT Syringe" in these instructions). It contains 300 mg of DUPIXENT for injection under the skin (subcutaneous injection). Read all of the instructions carefully before using the DUPIXENT Syringe. Ask your healthcare provider how often you will need to inject the medicine. 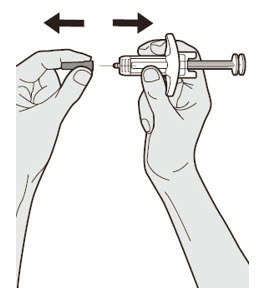 Rotate the injection site each time you inject. 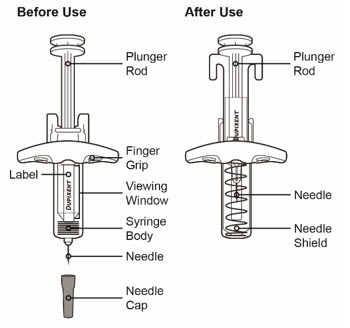 Do not use the DUPIXENT Syringe if the Needle Cap is missing or not securely attached. Do not touch the Plunger Rod until you are ready to inject. Do not get rid of any air bubble in the DUPIXENT Syringe. To reduce the risk of accidental needle sticks, each pre-filled syringe has a Needle Shield that is automatically activated to cover the needle after you have given your injection. 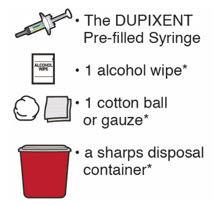 Throw away (dispose of) the used DUPIXENT Single-Dose Pre-filled Syringe right away after use. See "Step 13: Dispose" below. Do not re-use a DUPIXENT Single-Dose Pre-filled Syringe. How should I store DUPIXENT? 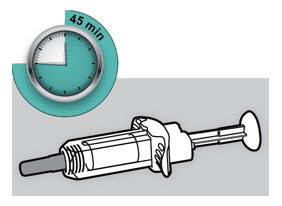 Store DUPIXENT Syringes in the refrigerator between 36ºF and 46ºF (2ºC and 8ºC). 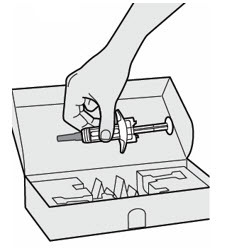 Store DUPIXENT Syringes in the original carton to protect them from light. DUPIXENT Syringes can be stored at room temperature up to 77°F (25°C) up to 14 days. Throw away (dispose of) any DUPIXENT Syringes that have been left at room temperature for longer than 14 days. Do not shake the DUPIXENT Syringe. Do not freeze the DUPIXENT Syringe. Check to see if the liquid is clear and colorless to pale yellow. 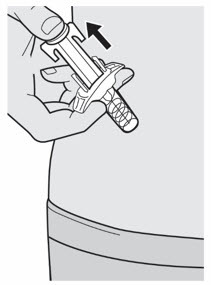 Pinch a fold of skin at the injection site (thigh or stomach, except 2 inches around your belly button, or outer area of the upper arm if injected by your caregiver). 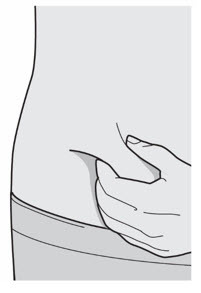 The figure below shows an example of pinching a fold of skin on your stomach. 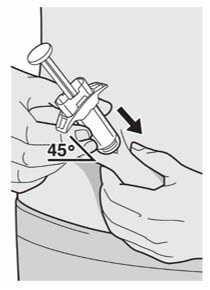 Insert the Needle completely into the fold of the skin at about a 45° angle. Push the Plunger Rod down slowly and steadily as far as it will go until the DUPIXENT Syringe is empty. 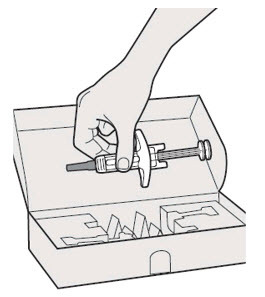 This device is a Single-Dose Pre-filled Syringe (called "DUPIXENT Syringe" in these instructions). It contains 200 mg of DUPIXENT for injection under the skin (subcutaneous injection). 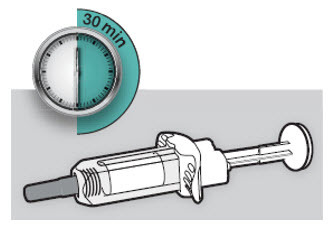 Lay the DUPIXENT Syringe on a flat surface and let it naturally warm to room temperature for at least 30 minutes. expiration. Do not use if seal is broken or damaged. Store refrigerated at 36° to 46°F (2° to 8°C) in the original carton. Dosage and Administration: See package insert for dosage information and directions for use.